Ms. Jennifer R. Aldridge J.D. Jennifer R. (Mann) Aldridge is an Indianapolis attorney who practices primarily in the areas of probate law, family law, business formation and real estate. Jenny has practiced mainly in these areas since she received her law degree and has received additional training as a Collaborative practitioner and as a Parenting Time Coordinator. She strives to provide clients with legal advice that is honest and practical. She received her Juris Doctorate from the Indiana University McKinney School fo Law and a Bachelor of Arts degree from Indiana University. Her volunteer work includes serving as a Guardian ad Litem through Kids Voice of Indiana and being a member of the board of Open for Service. 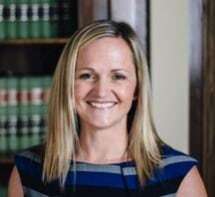 She is a member of the Indiana State Bar Association and the Indianapolis Bar Association and belongs to the family law section and probate and real property section of both associations. She was recently honored to be included in the Indianapolis Bar Association's Bar Leadership Series Class XIII for 2015 and 2016, and Super Lawyers for 2017, 2018, and 2019. Jenny resides in Indianapolis with her family.